We off 12 clean, modern, housekeeping cabins. Fully furnished and just a few feet from the crystal clean lake! Beautiful sunsets and peacefulness you will enjoy on your vacation here. New 6 Bedroom Cabin for 2019, Booking Now. We offer weekly activities for the kids a few days a week, we offer free use of all our resort toys, and there are so many things to do in the area. Horse Stables, safari, golf, bike trails, deep portage reserve, and so much more. We have so many beautiful pictures of our resort, we have put a few on here, if you want more check out our Facebook page. EVERYTHING TO MAKE YOUR VACATION PERFECT. Our large swimming beach offers crystal clear water with no drop offs – great for kids of all ages. Relax in one of our lounge chairs while watching the kids enjoy the slide, swim raft, or water trampoline. We have a large playground area connecting to our beach. Enjoy the peace and tranquility of nature from the Deep Portage Reserve which surrounds us on the northern shores. Big Portage Lake has open channels to Rice Portage and Deep Portage Lakes. The Paul Bunyan Trail is only 4 miles away for a bike ride in the summer or cross country skiing and snowmobiling in the winter. We also have snowmobile rentals – check out our Equipment Rental page. Sit by your campfire, relax, have some delicious s’mores and watch some of the most spectacular sunsets as the day winds down. In the early morning take a kayak and tour the natural shoreline across the lake to witness the wildlife. For all you fishermen, there are plenty of walleye, northern, bass, crappies, and sunnies, so do some fishing and go home with a story. Open year-round for your ice fishing adventures too! We have a small store which offers bait, ice, pop, and snacks to take with you on your fishing adventure. Need a getaway day Black Bear Golf Course is just a 10 minute drive. Turtle racing, duck racing and fishing contests are all with in minutes of our resort. Want to do some shopping or dining? It’s all within a hop skip and a jump! Swim or build castles on a sandy beach with no drop-offs, which is great for kids of all ages. Play on the Fun Bugs, Hydro Paddlers or paddle boat. 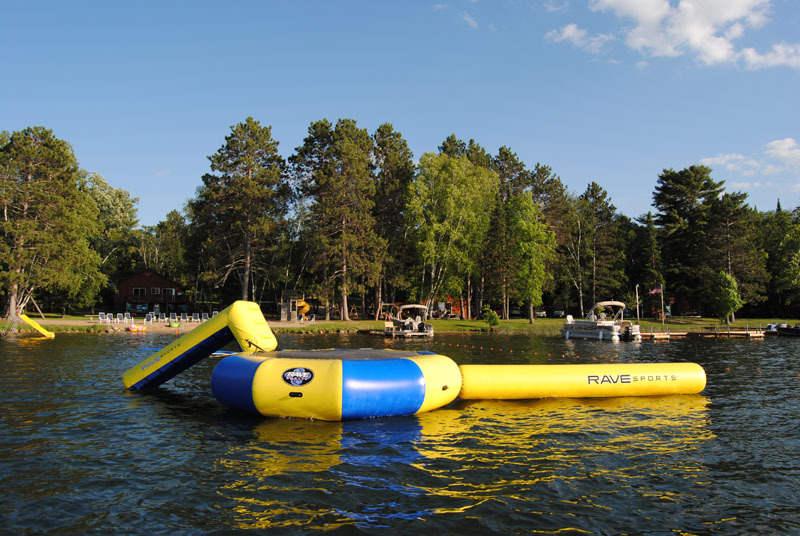 Swim in the clear water to the raft or the trampoline, or go down the slide. Organized activities with the kids. Some of the weekly activities are minnow races, treasure hunts, bracelet making, and canvas painting. Organized activities with the kids. Some of the weekly activities are minnow races, treasure hunts, bracelet making, and rock painting. We are members of the Explore MN, Brainerd Lakes Chamber of Commerce, Pine River Chamber, Congress of Minnesota Resorts, Brainerd.com, resortsandlodges.com, and MN Resort & Campground Association. Also Some Area Attractions, click on link below!